When I heard that Mozilla would be outlining their own open web app ecosystem for the first time today, my immediate thought was that this was to pre-empt the Chrome Web Store. I still think that, but I think the timing may be even more calculated now. From what I can gather, Google’s launch of the store may be imminent — only a few obstacles remain and the search giant is working quickly to hammer them out. First of all, this morning, Google officially unveiled Chrome 7, the latest iteration of their web browser, with little pomp and circumstance. The company has said they’d be plowing through new versions much faster than they have previously (a new release every six weeks or so), so they’re downplaying it. But it appears that this may be a critical step one in getting the Web Store ready to go. While it’s not mentioned anywhere in the posts on the matter, Chrome 7 has web app support enabled by default. You may not see it yet, but that’s because you have to install an app for it to work. Google is still hiding the Web Store from consumers (it’s in developer preview mode), but if you manually install an app (Google how to find some), you’ll trigger the feature to turn on, and you’ll see a link to the Chrome Web Store as well. 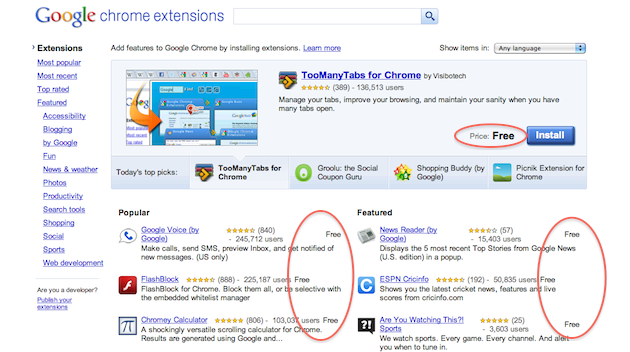 The second sign that the Web Store nears is that Google turned on extension pricing this morning. It appears they may have done this a bit early by accident, as the price column has vanished once again, but it was there, I got a screenshot as did others. This is significant because the extension (and theme) gallery will be run through the same area as the Web Store. Presumably, extensions will remain free, but web apps will be available for purchase — that’s why this pricing feature was enabled this morning. Third, if you look at the list of Chromium bugs, you can see a number of references to the Web Store and its launch. This thread talks about a Web Store promo that will be enabled when you first open a Web Store-enabled version of Chrome. Of note, there will apparently be a default list of Chrome web apps — undoubtedly Google apps — not that this should be surprising. This thread talks about the app launcher, and a last-minute rush to get this in the first update of version 7 of Chrome. A couple other interesting threads talk about the need for a browser-based Google Profile sign-in for the Web Store. This is particularly interesting to me given my post about a social version of Chrome last night. Of note, on this thread, someone asks, “Is the Web Store team not depending on this for their launch? (Has the Web Store timeline changed?)“. The response seems to be that profile sign-ins may be a part of Chrome 8 or even 9. Further, talk of an extension API for the Web Store also mentions browser sign-in, but indicates it will be a part of version 8. These last two bits are interesting. They could indicate that Google means to launch Web Store support in a beta version of Chrome first. Version 8 recently hit the dev channel of Chrome, and it will likely be in the beta channel shortly. 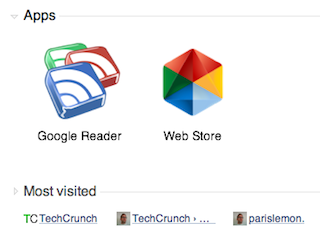 It’s possible Google could be waiting on that for the Web Store initial roll-out. The latest builds of Chromium (the open source browser on which Chrome is based) do appear to have Google sign-in support enabled in a way that it hasn’t previously (or at least it’s more visible now). Regardless of the logistics of the roll-out (Chrome 7 or Chrome 8 beta), it does appear that the launch of the Web Store is very close now — though nothing “official” yet. Google hinted at an October launch a couple months ago, and it looks like they’re going to hit it.